Synthetic peptide conjugated to KLH derived from within residues 1000 to the C-terminus of Human ZNF217. 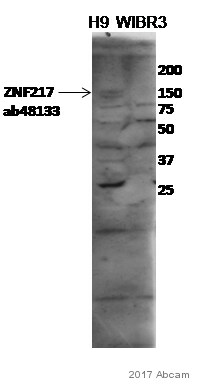 This antibody gave a positive result in ELISA against the immunizing peptide (ab48177). Binds to the promoters of target genes and functions as repressor. 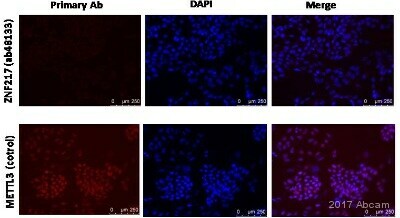 Promotes cell proliferation and antagonizes cell death. Promotes phosphorylation of AKT1 at 'Ser-473'. Publishing research using ab48133? Please let us know so that we can cite the reference in this datasheet.